What do you think about group assignments? If you are a university student, chances are high that group assignments will accompany you throughout your academic career. The objectives are well known: e.g. developing stronger communication and time management skills, learning how to collaborate and share diverse perspectives while solving arising conflicts together as you go. However, we are not explicitly taught on how to do that. The approach is rather practical: learning by doing. In the following paragraphs I want to give you an overview about some challenges for teamwork in an international business context. Maybe it can provide you with some useful pointers as to how to navigate the group assignments you have during your studies. The goal is for you to become aware of certain dysfunctions that can arise while working in a team, so you can consciously take action to mitigate or avoid them, making you a better team player. Multinational companies have access to a pool of experts from their global network. When there is a need to form a global team, to help the company to compete in a promising market, they can bring together team members with different cultural and functional backgrounds, experiences, and perspectives. However, they need to be aware of several factors that can make teamwork less efficient. A different cultural background can mean different attitudes towards hierarchy and authority, different preferences for communication (direct vs. indirect), and conflicting norms in decision making (Brett et al., 2006). Additionally, when team members are geographically dispersed, it is more difficult to build connections and alignment, since there is less face-to-face interaction. Both can lead to miscommunication and misunderstanding, and subsequently negatively affect cooperation and trust within the team. Neeley (2015) calls this the vicious dynamic (see Figure 1). 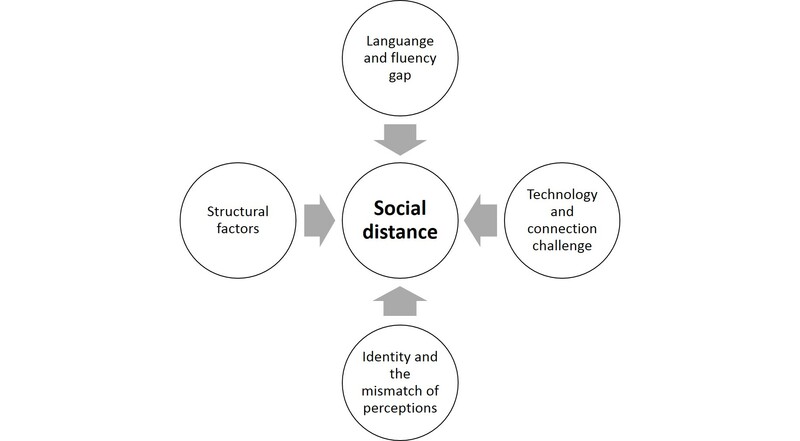 In his research he proposes a framework (see Figure 2) that helps to avert this dynamic by looking at the concept of social distance, which measures the degree of emotional connection between team members. Social distance can arise from structural factors such as location, the number of sites where team members are based and the number of employees who work at each site. If the team leader is located in the same place where the majority of the team members are or close to the company headquarters, the needs and contributions of the minority team members at other locations are often overlooked or deemed as less important, causing a perceived power imbalance. It is the responsibility of the leader to alleviate this power imbalance by actively involving every team member, encourage sensitivity, and build unity. A definitive characteristic of global teams is that the team members have different levels of fluency in the chosen language of communication. Members who are more fluent dominate the discussions and exert more influence while the others, who are just as competent, find it difficult to contribute. This can lead to a whole lot of inefficiencies starting with demotivation, interpersonal conflicts, and not utilizing the full potential of the team. Neeley (2015) proposes 3 rules of engagement to counter this problem (see Figure 3). Fluent speakers need to dial down their dominance, while less fluent speakers should dial up their engagement. The role of the team leader is to balance the inclusion. Communication technology can have a positive or negative effect on social distance. Which effect is rather desired depends on the purpose of the communication. Face-to-face meetings and video conferences enable the perception of body language and facial expressions, decreasing social distance. They are best to be used when the other party needs to be persuaded. Delayed communication, like E-Mails, are efficient when information needs to be shared. The lack of contextual cues in this context increases social distance. Identity (age, gender, nationality, ethnicity, religion etc.) can determine the meaning of certain behaviors. It is crucial for all the team members to keep an open mind, learn from each other, and avoid assumptions on the meaning of behaviors. The way people give feedback may be different. Some people might be encouraged by direct criticism others may find it offensive and prefer an indirect way of feedback. The author puts a lot of emphasis on the responsibility of the team leader to recognize and reconcile the different forces that can lead to dysfunctional teams. They have an integrative and exemplary role. The teams you are working in during class usually have a flat hierarchy, without an assigned team leader. It is therefore helpful when all the team members are able to recognize budding problems to make their collaboration more efficient. Can you recognize yourself in the framework? Do you feel like your opinion is not taken seriously? Do you feel demotivated, because you cannot show your full potential in a group setting? Maybe you can use this framework to start a conversation. Furthermore, I would urge you to deliberately seek out diverse team members for your future group assignments, for the added challenge as well as for the added learning effect. What do you think?